California’s population is 36% Hispanic, the second-highest Hispanic population share nationally behind New Mexico with 45%. 23% of eligible voters in California are Latinos, the third-largest Hispanic eligible voter population share nationally behind New Mexico with 38% and Texas with 25%. 38% of Latinos in California are eligible to vote, ranking California 26th nationwide in the share of the Hispanic population that is eligible to vote. 34% of Hispanic eligible voters in California are ages 18 to 29. By contrast, only 23% of all California eligible voters, 31% of Latino eligible voters nationwide, and 22% of all U.S. eligible voters are in that age range. 30% of Hispanic eligible voters in California are naturalized U.S. citizens compared with 19% of all California eligible voters. Nationwide, 93% of all eligible voters are citizens by birth, as are 74% of all Hispanic voters compared with 70% of California Hispanic eligible voters. 28% of Latino eligible voters in California have not completed high school, similar to the share of all Latino eligible voters nationwide. Only 13% of all California eligible voters and 14% of all eligible voters nationwide have not completed high school. 61% of Hispanic eligible voters in California live in owner-occupied homes compared with 64% of all California eligible voters. A greater share of all eligible voters nationwide (71%) live in owner-occupied homes. 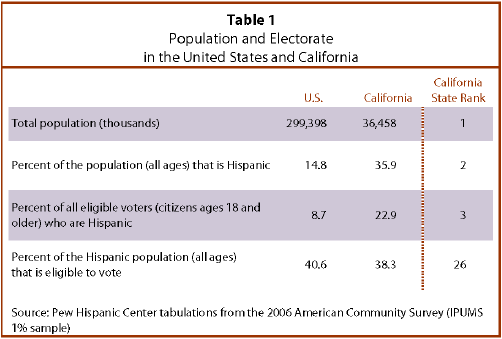 Latino eligible voters outnumber black eligible voters in California by more than 3 to 1. Twice as many Hispanics as Asians are eligible to vote in California—5 million versus 2.5 million. Latino eligible voters are younger than white, black and Asian eligible voters in California. 34% of Latinos are ages 18 to 29 compared with 18% of white, 25% of black and 21% of Asian eligible voters. Asian eligible voters in California are more than twice as likely as Latino eligible voters to be naturalized citizens—70% versus 30%. California Latino eligible voters (61%) are less likely to live in owner-occupied homes than white (68%) and Asian (71%) eligible voters in California.